When I cycled on the mountain bike trails at the cyclopark, I couldn't help but wonder what it might be like to run on these trails. Then, by some strange coincidence, the Rocky Road Trail Series at the cyclopark was announced. It was to be a series of three races with one each in May, June and July. 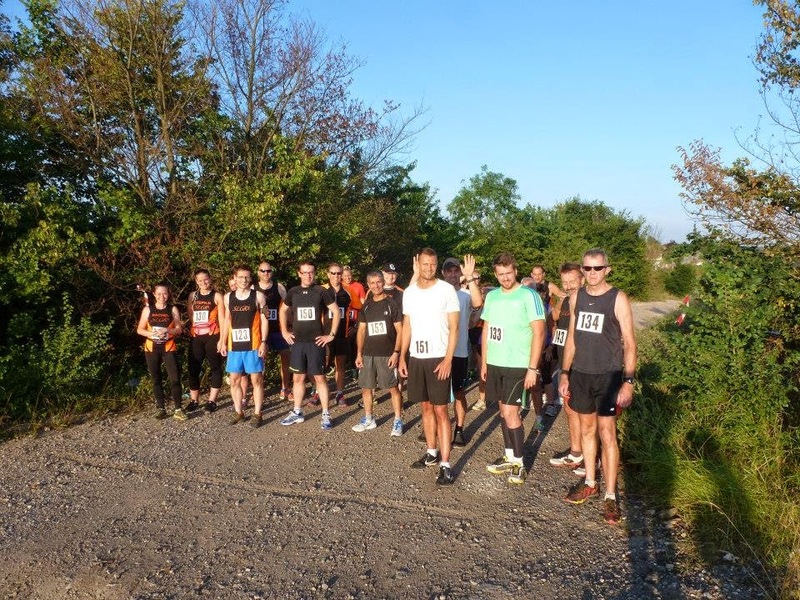 I was out of the country for the May race and the June race was two days after the North Downs Run, and I didn't want to ask any more of my body after running that. Thankfully the July race fell quite nicely and there was nothing to stop me from entering this one. This race took place on a Tuesday evening, which is usually our main club night. But with this event being a one-off, I thought it would make a nice change for any of my team mates that fancied mixing things up a little. So in the weeks leading up to the race, I spread the word on the So Let's Go Running Facebook page with the goal to turn the cyclopark black and orange. In the end, we had a very respectable turnout of 11 of us from our club. I also took the family along and asked the wife if she wouldn't mind taking some photos of us all as we raced. Some members of SLGR registered (£8) in advance, but I waited until the day and signed up upon arrival at the cyclopark. The series was put on by Steve Cable and his wonderful team of volunteers. Steve also organises the free, weekly cyclorun (facebook), which is 5k around the tarmac cycle track every Sunday morning at 8am. Steve was one of the first people that I bumped into and he had just finished marking out the course. I was going to recce it before the race, but time ticked by, people arrived, and in the end it just didn't happen. I did manage to squeeze in a short warmup run on part the trails with a couple of SLGR runners a few minutes before the start of the race. Race start time was 7.30pm, and a few minutes before that, we were lead from the main reception building to a wider area where Steve marked a line in the gravel - this would act as the start and the finish. The course was a two-lap circuit of the mountain bike trails that run around the outer edge of park - they have different levels of difficulty with the black routes being the hardest. Underfoot the course was a mixture of some gravelly stones, dirt trail, rocky paths, and big rocks (or you could call them boulders). The terrain was mildly undulating and featured some very twisty sections of single track mountain bike trails. I lined up at the front, knowing that I would need a good start to avoid being caught up in the crowd once the route reached the single track which would make overtaking very difficult. So I started well, but made the slight error of being too polite as we approached the single track and I ended up out of position with no easy way to move through the field. I stayed patient and held back, then there was an opportunity to overtake on a corner, but again I was too polite and actually lost a place. I was now in 5th place, knowing that I was running at a slower pace than I would have liked and with no easy way overtake. The worst thing was that I could see the leader pulling away from us. I stayed patient as we followed the twisty path through the first kilometre of the course and then I managed to find a couple of points that were wide enough to make some overtaking moves. By the end of the first kilometre, I had made it up into third position, but was again stuck and could only watch as the leader disappeared further into the distance. Then I found an another overtaking point, moved into second place and had the task of trying to claw back some of the lost ground. I was now 1.5km into the race, and at this stage, the leader must have had a 20-30 second lead, so I just stuck with a good strong pace and slowly I could see that I was gaining on him. As I came back past the main central area (2.8km), I had cut the gap down to about 10-15 seconds. By the 3.3km point, I had caught up with him but the narrow trail paths prevented me from overtaking. So I spent the next 1.5km on his tail waiting for the widest of the overtaking points to appear, and when it did, I took the opportunity to move past. I was now in the lead and did not want to lose it. I had a sense that I had opened up a little gap, but I wasn't sure if it would be enough. I was thinking about the team and how great it would be if we could get a win. With that thought in my head, I pushed as hard as I could along the final kilometre. The setting sun was behind me and I could see my shadow stretching out in front of me, I knew that if my competitor was gaining, I would see his shadow before he had an opportunity to pass. However, it never appeared and I crossed the finish line in first position and gave #teamslgr their first proper outright race win! A proud moment. I had finished 22 seconds ahead of the second placed runner. I was really pleased with my efforts to catch him and then to still have enough left in me to pull away through that final kilometre (my gps data). After a few cups of water, I chatted to some other finishers and then got in position to cheer on the rest of the SLGR gang as they approached the finish line. They all looked really strong as they pushed through the last section - hopefully that's a sign that the Tuesday and Thursday sessions paying off! The prize giving ceremony took place on the patio area outside the cafe. I knew my result, and was very excited to collect my winners' medal from Steve. But there were also team prizes up for grabs. We had taken quite a large group down and I was hoping that we would be in with a good chance of another prize. In the end it turns out that we won the mens and the womens team prizes with our top three finishers of each gender picking up a bottle of wine each. The full results can be found on the cyclorun facebook page. 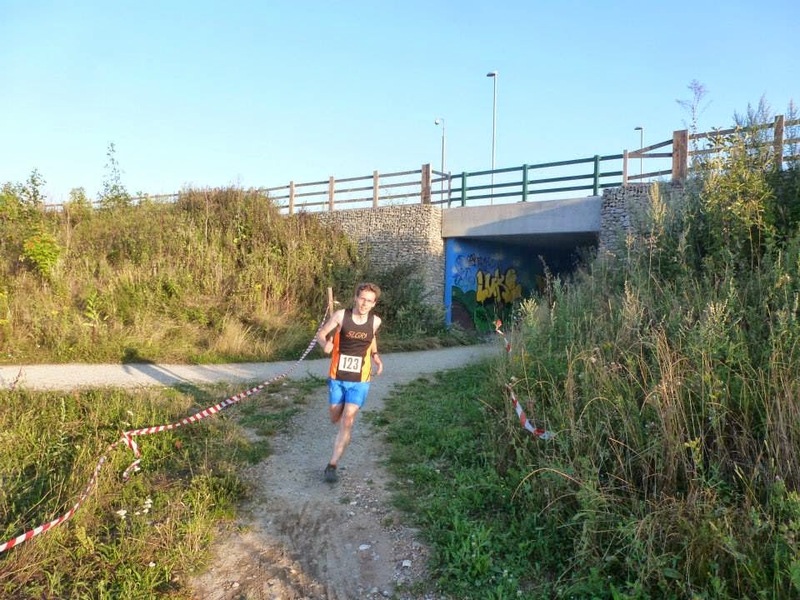 This was a really good trail race - the terrain was much rockier than what you would usually find on a typical south east England trail race. The rocky nature of the course made this more like a mountain-style trail race but without the huge inclines. I really loved it and I'm already looking forward to next year's series. To top it all off, the amazing sunset really did turn the cyclopark black and orange... What a great evening for #TeamSLGR!